Hi everyone. Two cards to share with you today. The first is my Design Team card for the latest challenge at Addicted to Stamps & More - Theme#6 (Vintage). This is not a style of card that I make very often ... but I think this CAS card still had a vintage feel to it. Most of the work is done by the gorgeous papers - Simple Stories "Generations". I sponged the Very Vanilla card front (and inside panel) lightly with Soft Suede ink to give the paper an aged look. The pearl "ribbon" is for my local $1 store - love it! I made the rose from the same patterned paper, making sure to cut the blooms out of the "rose" pattern section of the paper. Makes for a very dark rose, which adds to the vintage feel. The leaves are also cut from the patterned paper. I sponged the fern with Certainly celery (covering it) and then added light sponges of Chocolate Chip ink along the tips of the leaves and along the stem. I misted it with lots of water and then blotted off the excess with a paper towel. I liked the look, but the colors were too soft, so I sponged more Celery and Chocolate Chip on top while the paper was still wet. I cut a frame using the rectangle nestie from Crumb Cake cardstock. I swiped my Chocolate Chip ink pad directly onto the frame to create an aged frame (love how it turned out!). I embossed a small piece of watercolor paper with the branches and glued it behind the frame. 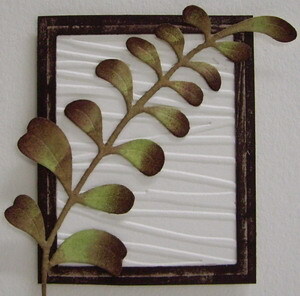 The frame is popped up on the card front and the fern is glued on top. Your vintage card deserves a frame Loll! Absolutely beautiful:) Love the pearl ribbon, what a bargain. Your second card is fab, love that fern die! Your CAS vintage is beautiful! That paper is just stunning. Also, I didn't see your CC card in the gallery -- you sure rocked out the colors! Your vintage card is so elegant, Loll! Love those pearls! And the fern on the second card is so beautiful. Thank you for the run down on how you did it! I'll have to try that. 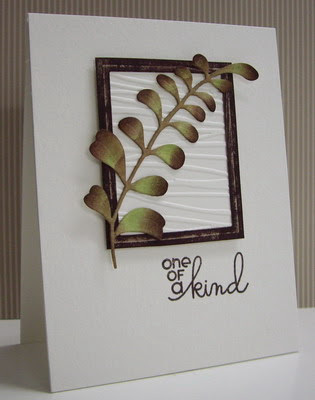 I really love that bit of embossing behind the fern! Really sets it off! Both cards are quite beautiful! Oh, such lovely cards! 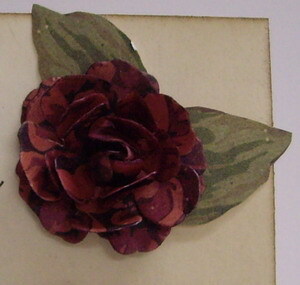 I adore pretty vintage cards, and I love the amazing rose and beautiful colors on yours! Beautiful cards, Loll! 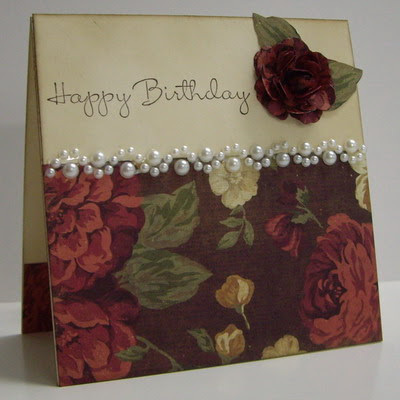 My next learning project is how to make cards with vintage feel but still keep them CAS -like this one. Love the paper and the rose! Hi Loll. Oooooo! I need this paper you have used on the first card!!!! Would love some fabric in those colours as well. It is gorgeous as is the card. Love your second card and the design. Both cards are just beautiful. I really like your style. Thanks so much for sharing! Two beautiful cards Loll and whatever style you do you always manage to make something truly beautiful. Both are fantastic, love the rose and the rich colours and how you did the pearl border. Your sponging and layout on the second is just divine. Gorgeous Loll. Thank you for sharing in my stamp debut. Whoa-oh! That floral card is amazing, Loll! I appreciate the CAS fern too. It has such a peaceful feel.